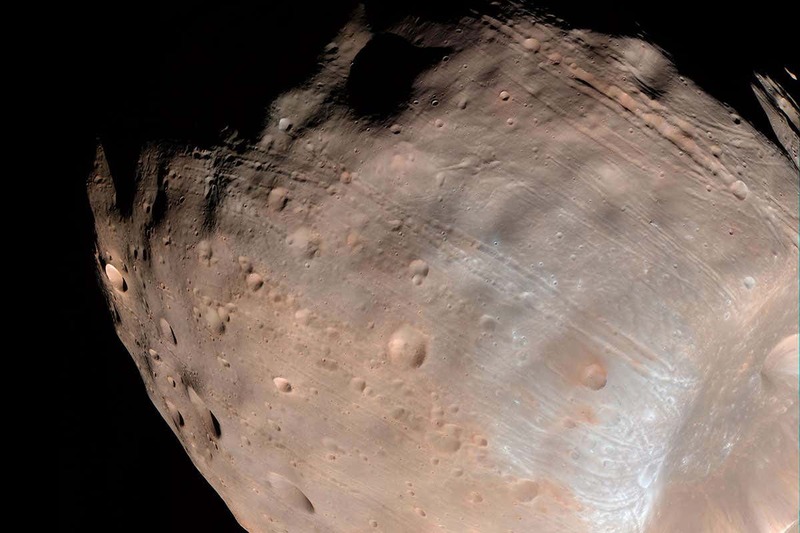 The surface of Mars’ biggest moon, Phobos, is covered in huge grooves that may have been caused by massive boulders rolling across its surface following an asteroid impact. There are other planets and moons with similar ditches and scratches, says Kenneth Ramsley at Brown University in Rhode Island, but none as completely covered in them as Phobos – the moon’s grooves are up to 30 kilometres long and 200 metres wide. Ramsley and James Head, also at Brown, used a simulation of the Phobos-Mars system to examine whether these grooves could come from rolling stones. The pair says these stones would have been ejected from Stickney Crater, which was formed when a rock about one kilometre across smashed into Phobos around 150 million years ago. Phobos is small and close to Mars, so the planet’s gravity would have acted on the boulders, causing some to roll all the way around the moon and creating the intersecting lines that we see on its surface today. The whole process would have taken less than 12 hours after the impact, Ramsley says. There is one area on the moon with almost no lines at all. The simulation showed that because that zone has lower elevation and Phobos has low gravity, the boulders would have simply rolled into space before returning to the surface, like a cartoon character running off a cliff and then landing on the other side. But there’s a problem: we don’t see any boulders on the surface. Ramsley said that this, too, may be explained by debris from the Stickney impact. “All of that extra rubble that doesn’t stay on the surface gets trapped in orbit around Mars and returns to the scene of the crime within 1000 years and hits Phobos again,” he says. That bombardment could have smashed up the boulders and hidden the smallest of the grooves under a layer of dust.